This recipe basically includes a whole host of my favourite things! I was sat trying to think of what I fancied for a late breakfast one day this week, looked in the cupboard, raided the fridge and came up with this! I loved how the earthiness of the artichokes balances with freshness of spinach and the saltiness of the feta. Marinated artichokes are a thing of beauty and so versatile so it’s always worth having a jar to hand. This recipe is for one person who fancies an indulgent treat but simply multiply the ingredients to share it with others. If you make it for more than one, I would suggest baking them in individual dishes as you simply won’t want other people to share this! 1. Start off by preheating the oven to 180c/ 160 fan. If you are using ceramic baking dishes which are quite thick then you can preheat these too. Take a frying pan and heat a small amount of olive oil over a medium heat. Add the onion, garlic and a pinch of chilli flakes (if using) and cook until starting to soften but not until they are colouring. 2. Take the artichoke hearts and blot with kitchen roll to remove any excess oil. Slice the artichoke into slivers which are going to be easy to scoop up with bread. Add to the pan with the onion and cook along with the chopped spinach. Allow these to have a minute or so to themselves. 3. Next up goes the ricotta into the pan with a small splash of water to loosen it up. Give this a couple of minutes. Crumble in the feta and stir well to combine. Take the baking dishes and spoon the mixture into it carefully. Use the back of a spoon to make a hollow in the centre of the dish and crack the egg into the centre. 4. Bake for around 15 minutes but this will vary according to the size of the egg you use so do check from time to time. In the meantime toast some sourdough bread. When the artichoke is heated through and the egg is done to your liking, serve immediately. I finished mine off with a few more chilli flakes for a little bit more of a kick. 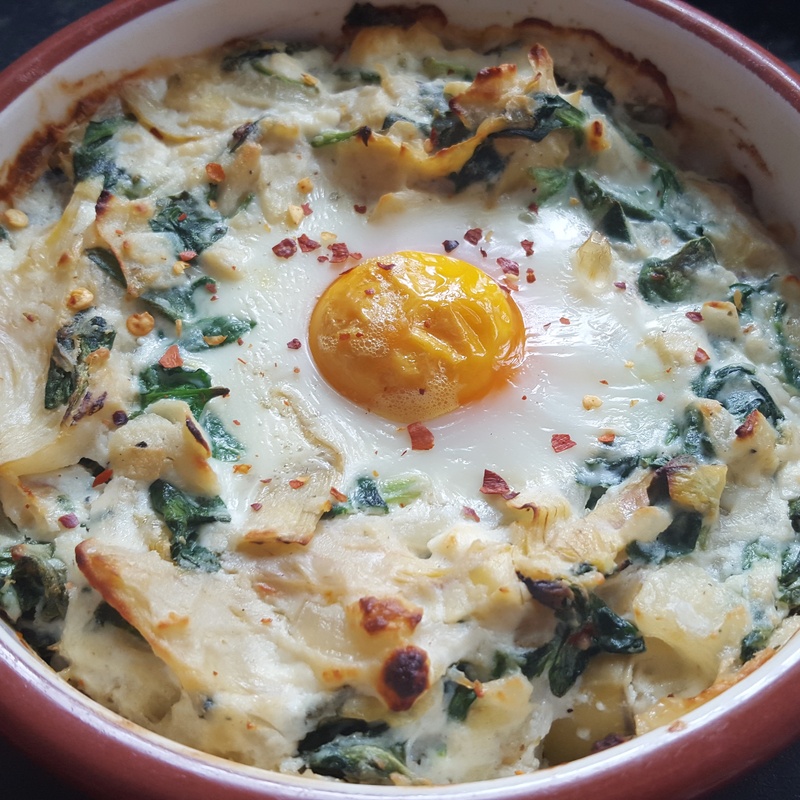 Artichoke, spinach and ricotta baked eggs- light, sumptuous and one of your soon to be new favourites! This little number is simple, delicious and so easy so you have no excuse but to give this a try. Usually jarred artichokes are associated with antipasti but use them in a different way and let them speak for themselves. I served it with roasted garlic and thyme new potatoes which were finished off with garlic sea salt alongside a beautiful fillet steak with a red wine, aged balsamic and shallot reduction (recipe below). 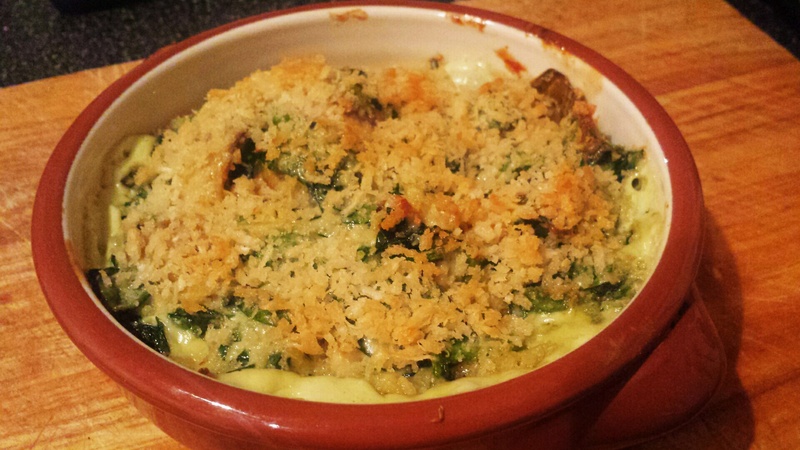 Unfortunately only a photo of the gratin and spuds made it- the rest disappeared before my very eyes (I hate it when food does that!!!). 1. Preheat the oven to 180c/ 160 fan ready to receive the gratin. In the meantime, heat a little knob of butter in a frying pan and cook the crumbs for a minute- remove and set aside. Clean out the pan and add a little oil and soften the shallot and garlic. Pop in the artichoke and spinach and cook for a further couple of minutes until the leaves are wilting. Drizzle over the cream and season before simmering for a minute. Place the mixture into an ovenproof dish, top with the panko crumbs and bake for 10-15 minutes until golden and bubbling. 1. Take the frying pan again and pop in the garlic clove, shallot and thyme and cook until turning lightly golden. Next in goes the balsamic vinegar and simmer for a minute until reduced and sticky. Pop in the red wine and reduce by half before adding the stock and reducing by around just over half again. When the reduction is ready simply finish off with a small know of unsalted butter and swirl in the pan. You will be rewarded with a deep, luscious and glossy sauce ready for the fillet steak.